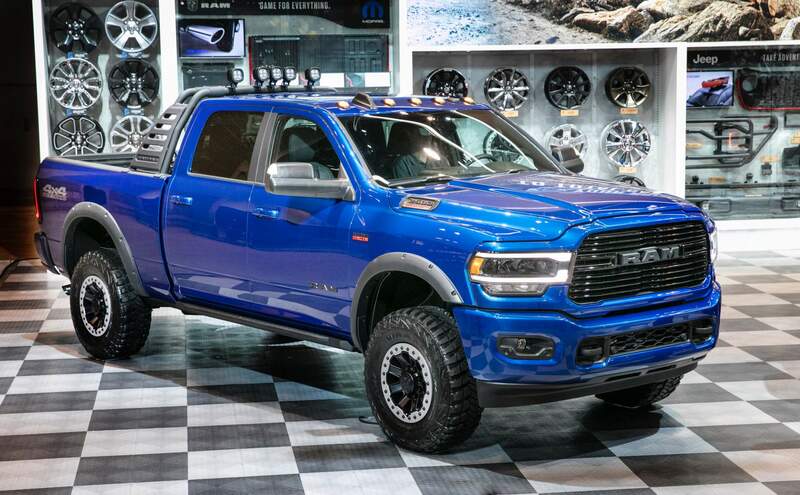 The 2019 Chicago Auto Show proved to be quite a treat for Ram pickup truck lovers. Tuner Mopar has attended the fair with as many as 170 parts and accessories slated for production for the 2019 Ram 2500 Heavy Duty Big Horn. Let us touch upon some of the highlights. Buyers of the next-gen model – which hasn’t even launched yet – will be able to opt for the Ram Bar, a truck bed add-on topped with five LED headlights 4,800 lumens each. Further exterior options include a rear bed step, a side access ladder, and wheel arch extenders. Also in development are rock rails, 17-inch beadlock wheels clad in Goodyear tires, a spare wheel housing, a trailer-mounted video camera, a trailer ball hitch, truck bed liners, organizers and extenders, tonneau covers for inclement weather, toolboxes, and more. Inside, Mopar will offer custom seat upholstery based on premium Katzkin leather, all-weather floor mats, door sill plates that read “RAM”, and a wireless smartphone charger, among other things.